The American Civil Liberties Union of Northern California is holding an event at the ILWU Local 34 Union Hall starting at 2pm on Sunday, December 9, to celebrate its accomplishments. 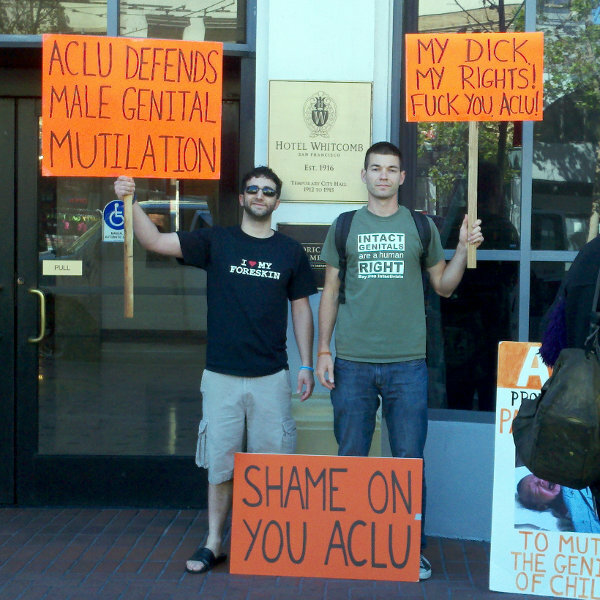 Members of Bay Area Intactivists will protest prior to the celebration in front of the building to condemn the ACLU's opposition to the San Francisco Male Genital Mutilation Bill and its endorsement of AB 768, the California state law which prohibits cities from restricting non-therapeutic circumcision to consenting adults. Join us to remind the ACLU that men's bodies are their own and that all children, regardless of gender, have a right to be protected from forced genital cutting. Thanks for being there and speaking out!